Print Book 1334 pages in 2 volumes (printed book) with downloadable forms Note: For print books, with MCLE's supplementation service, new supplements and revisions are mailed automatically with an invoice. If you do not want to subscribe, please check the opt out option during checkout. 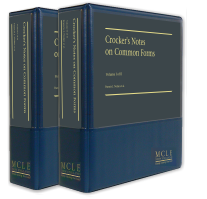 In response to customer demand, MCLE revised Crocker's Notes on Common Forms and made it readily available to the entire bar. Crocker's has been long sought after for its invaluable notes on a wealth of real estate issues. This book is the unparalleled source to turn to when handling tricky title problems or tracking down answers to conveyancing questions. A stellar cross-section of over 38 distinguished veteran practitioners have pooled their expertise in this revision, to recreate the most authoritative resource of its kind. No Massachusetts practitioner working — even peripherally — in the field of real estate should be without a copy. Known as the "bible" of Massachusetts title and conveyance practice, Crocker's Notes on Common Forms has been an essential reference for practitioners for over 100 years. MCLE has brought this classic up-to-date on all the statutory and case law developments since the previous edition was published in 1955. The landscape of real estate has changed dramatically since the '50s, and the thoroughly revised Ninth Edition takes you into the new century by tackling all the issues that have arisen over the last five decades. Indepth revision of the material on foreclosures, wills and probate proceedings, powers of attorney, deeds and mortgages. See Chapter 5 for discussion of two 2016 cases addressing mortgage debt, along with a number of recent federal cases interpreting and applying the principles of the Eaton case. In Chapter 10, find a citation to a 2017 case where the Appeals Court affirmed the validity of a mortgage where the closing attorney altered the mortgage after it was signed, but prior to recording. See Chapter 16 for discussion of a 2016 decision treating nonÂ¬exempt personal property used for business purposes as commercial or industrial property. The chapter also draws to your attention some 2016 amendments related to residence passing to the surviving spouse. In Chapter 26, see a discussion of case law, including a Rule 1:28 unpublished opinion, addressing the presumption of adversity in adverse possession litigation. Chapter 19 offers a cite for a case wherein a title insurer was correct in denying coverage, based on created suffered exclusion, for senior mortgages not listed as exceptions. We trust that you will find this material useful in your real estate practice, and valuable in keeping your law library current. Truth-in-Lending—In November 2013, pursuant to sections 1098 and 1100A of Dodd-Frank, the Consumer Financial Protection Bureau (CFPB) issued the Integrated Mortgage Disclosures Under the Real Estate Settlement Procedures Act (Regulation X) and the Truth in Lending Act (Regulation Z) (TILA-RESPA Final Rule), combining certain disclosures that consumers receive in connection with applying for and closing on a mortgage loan, and the 2013 Loan Originator Rule Under the Truth in Lending Act (Regulation Z). The Regulations went into effect on October 3, 2015, and have required substantial changes in mortgage lending and conveyancing practices. Find more information about the regulations in Chapter 5. Clouds on Title—Affidavits—General Laws c. 244, § 15 was amended to provide that an affidavit executed in accordance with § 15 shall, after three years from its recording with the Registry of Deeds, constitute conclusive evidence in favor of an arm's length third party purchaser for value that the power of sale was duly executed and the foreclosure complied with Chapter 244 as well as G.L. c. 183, § 21. See 2015 Mass. Acts c. 141. See Chapter 10 to determine when the conclusivity provision will not apply. Tax Exemptions—For discussion of recently added exemptions and a reference to G.L. c. 59, § 5CÂ½, added by 2014 Mass. Acts c. 62, § 14, effective July 2, 2014, see Chapter 16. Partition—For new case law discussing valuation of the divided parcels after a division in kind is ordered, see Chapter 27. Party Walls and Lateral Support—The duty of lateral support "does not give a landowner the right to effectively require by unilateral action that his or her neighbor provide lateral support for changes in natural grade or other improvements" to the landowner's property. For a 2015 Land Court case on this topic, see Chapter 33. We at MCLE trust that you will find this supplementary material to be useful in your practice and valuable in keeping your law library current. Notification and accounting requirements in mortgages. Under G.L. c. 183, § 27, the mortgagor is entitled to an itemized accounting of the proceeds. Recent federal decisions call into question whether the notification and accounting requirements of G.L. c. 183, § 27 are preempted by federal law. You will find those case cites in Chapter 5. Assignment of mortgages. As to the effect of the assignment of a mortgage note not accompanied by any assignment of the mortgage, a 2012 case has construed a mortgage separated from the underlying debt that it is intended to secure as "a mere technical interest." See the case and other recent decisions on this topic in Chapter 7. Foreclosure of mortgage. Because Massachusetts is a jurisdiction requiring "strict formality" in the execution of acknowledgements, the failure by a notary to fill in the name of the document's signatories is a defect sufficient to allow the Chapter 7 bankruptcy trustee to avoid the mortgage under 11 U.S.C. § 544. Find the case that supports this principle in Chapter 10. Easement not extinguished. For a 2012 case establishing that where a mortgage containing a right to create an easement when recorded and granted is exempt from mortgage, the sale of the locus under a power of sale does not extinguish easement, see Chapter 20.